On this day, March 27, 2012, the Huskies just lost a overtime game to Minnesota in an NIT Final Four game. 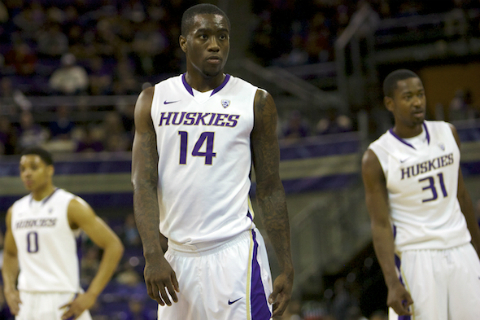 Yes, they were the #1 seed in this tournament, but yet again, a slow start doomed the Huskies. This is a disturbing trend that I saw in the past few games Washington has played, even in some of their wins. It has become an all-too-common theme for these Romar-led Huskies. Is Romar just a so-so coach that cannot get his team prepared for big games? Is Romar even a top-notch recruiter? Even after several trips to the NCAA tourney, the state’s top players are still going out-of-state to the bigger name programs. I even checked the 2012 recruiting for the Huskies, and they have absolutely NO recruits in 2012. As for the current players, the future is even more cloudy. Tony Wroten and Terrance Ross possibly may jump ship and head for NBA riches. In my opinion, I believe Wroten will stay at least another year, just to work on blatant flaws in his game (i.e., free throw shooting, no outside jump shot, etc.). Ross, on the other hand, is a goner. I don’t see anything else Ross needs to prove that he is NBA ready. It would be great if he can stay for his junior year, but if he’s projected as a potential lottery pick, why shouldn’t he go?